"Golovin visited Spain only three or four times - less than France, Germany or Italy, to which he travelled in the years before World War I almost every year. 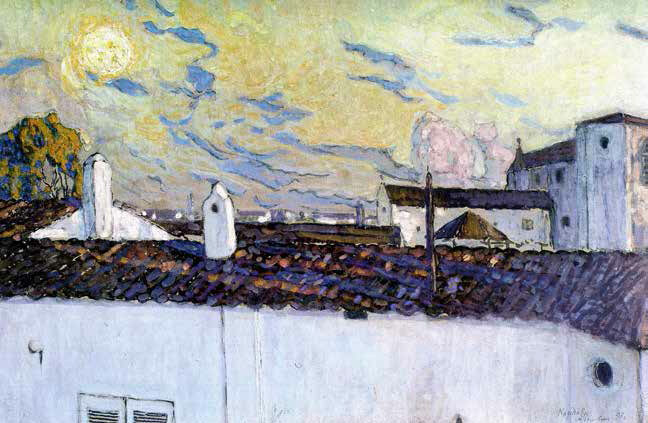 But Spain became something of a poetic homeland for the artist, and a lasting source of inspiration for him. 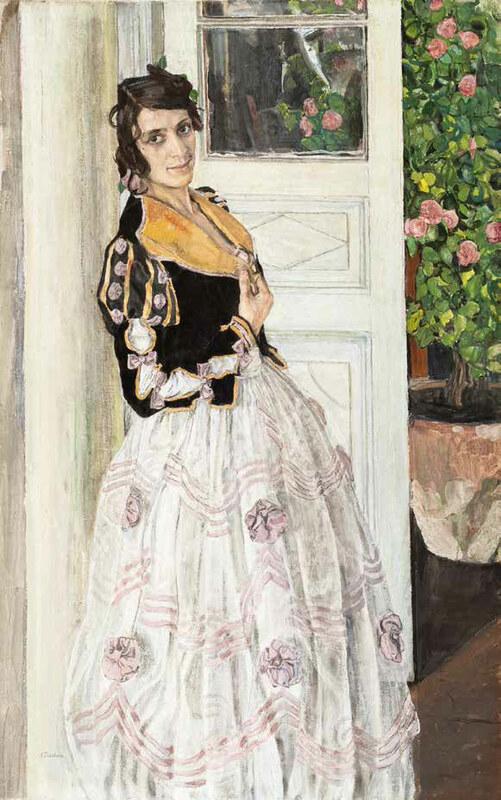 Golovin studied the Spanish language, knew the country's history, literature, music and art very well... [The works he painted on Spanish themes and his theatrical productions involving Spanish motifs] can only be termed 'genre' works in the loosest sense, rather they are painting-remembrances, painting-fantasies, in which Golovin expressed his painterly view of Spain, and his feeling for the Spanish national character." The fact that Onufrieva was not even certain of the exact number of visits that Golovin made to Spain speaks for itself. Both Golovin in his “Meetings and Impressions", and Eric Gollerbach in his 1928 biographical study, conflated the artist's first two visits into one experience. We know that he went to Spain first in 1896, in the company of A.A. Karzinkin, travelling there from Italy. He describes their route in “Meetings...": Madrid (where they visited the Prado, “with the best collection of Velasquez, and many works of Murillo, Ribeira"), Toledo (“retaining its ancient Mauritanian appearance"), “lively" Barcelona, “gloomy" Burgos, Valencia (“an Eastern-coloured bright city of light blue, white and gold cupolas"), Granada (“I was especially attracted to Granada, where I worked much in the Ahlambra, copying the adornments of that famous palace, representing as it does the most excellent example of Mauritanian architecture"), Cordoba (“a half-destroyed town, in the past one of the centres of European culture"), Seville (“poetic. famous for its carnival"), and “painterly" Malaga. 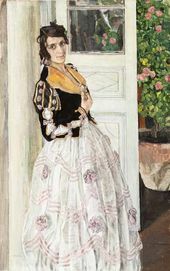 But Golovin's reference to his work in Granada must refer to his second visit to Spain: he returned there in October-November 1897 with Yelena Polenova, who had been advised by her doctors to travel to warmer climates. They departed first for Paris, but as the weather there was cold, they continued on to Madrid and Granada, staying for five weeks in all, before returning to Paris on November 2 (14). 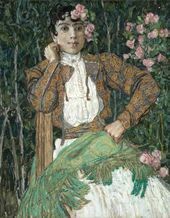 Golovin's second visit to Spain came on the eve of momentous events for the country, which would be mirrored in its artistic life: 1898 was the year in which Spain lost her last colonies in Cuba and the Philippines in the war with America. Spanish artists and other cultural figures of the time came to be known as the “Generation of '98". “Toward the end of the 19th century, this very phenomenon of remoteness would become a vital matter of debate for dozens of critics and philosophers, most notably Miguel de Unamuno, who approached the problem of how to bring Spain and Spanish art out of this very contained border, not so much to elevate it to the level of other art elsewhere, but in order to help preserve its character within a unified national identity." These events made the country, “which determinedly preserved its autonomy and sometimes self-imposed isolation from the rest of Europe", reassess its position in the world, and concentrate on the development of a new identity. A distinct part of that artistic identity involved its reflections on the visual atmosphere of the Spanish regions, which were still largely defined by their past. 1898 also saw the publication of another important work, the travelogue “España negra" (Black Spain) by the Belgian writer Émile Verhaeren, illustrated by the Spanish artist Dario de Regoyos, which defined a certain identity for the scenes of rural Spain that they visited, one which was reflected not only literally in the frequent use of black as a colour, but as a mood in itself. 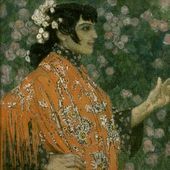 Its title became a term which would be used most frequently in reference to the work of the artist Ignacio Zuloaga (18701945), and to a lesser extent Hermengildo Anglada-Camarasa (1871-1959). The Spanish community of artists in Paris - few were permanently resident there, returning to Spain for part of each year - was a close one, its members often frequenting the same cafes and bars. Pablo Picasso was a later addition to the group, born a decade later than the other three artists, and his artistic contacts with Russian collectors would quickly come to dominate those of his older fellow countrymen. Picasso certainly moved in these same Spanish artistic circles in Paris, however, as evidenced by the fact that one of his first works on his arrival in Paris in 1900 (the year of the momentous Exposition Universelle, in which the work of all these artists was displayed) was a black and white portrait of his friend - and fellow Catalan - Anglada. 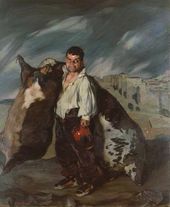 Although Picasso's subsequent fame would far eclipse that of the other Spanish artists in Paris, it is worth remembering that the success of the older artists in the early years of the 1900s was considerable: "Joaquin Sorolla and Ignacio Zuloaga... whose works were purchased with the enthusiasm we associate with international stars and with prices in accord with their celebrity." Like their Russian contemporaries, Golovin among them, the Spanish artists studied at the independent Paris art schools: Zuloaga and Anglada at the Académie Julian and Académie Colarossi, where Anglada would later become an intermittent teacher after 1900. 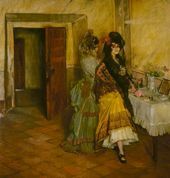 We can only wonder in Golovin's case whether he encountered Anglada at the Académie Colarossi in the years 1896-1897, when both are listed as studying there: the Russian artist makes no mention of any such meeting in his memoirs. However, Golovin would certainly have known the work of both Zuloaga and Anglada - the artists are very little known outside Spain today, and far from famous even within their native country - from publications of their work in the Russian art magazines of the period. 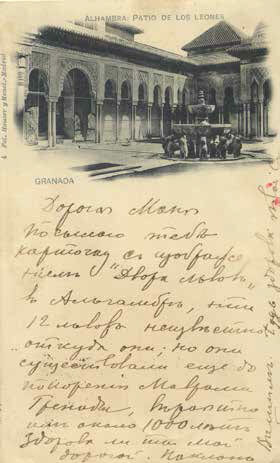 Between 1901 and 1904 "Mir Isskustva" published detailed reviews of European exhibitions which included their work. In 1901 Konstantin Makovsky wrote: "Diaghilev is exploring the Parisian salons, looking at Maurice Denis, Gandara, Anglada." Diaghilev himself wrote of “some small pieces by Anglada" at the 1901 Salon: “The young Anglada, for the first time, has successfully developed a talent a bit in the manner of Besnard, with some dancers." Further reviews followed in 1902, with Anglada's work mentioned from a group show in Berlin at the Schultes Kunstsalon, where the artist exhibited his “Danza gitana" (Gypsy Dance), later acquired by Ivan Morozov (the picture is now in the Hermitage). It is not entirely clear whether Morozov bought that work in Berlin, or in Paris the following year, where Igor Grabar noted at the Salon two works by Anglada, that same “Danza gitana" as well as “Andares gitanos (Walking Gypsies). “His work is much improved compared to last year," Grabar wrote, emphasizing a distinction between the work of Zuloaga and Anglada. In one of the final issues of “Mir Iskusstvo" in 1904 Grabar again wrote on Anglada's work from exhibitions in Berlin and Dusseldorf, and made another comparison, this time to Alexandre Benois. Zuloaga's work was also in these shows, and Grabar concluded, in a reference to Anglada: “Zuloaga has a very dangerous opponent who is starting to really have a sensational success." 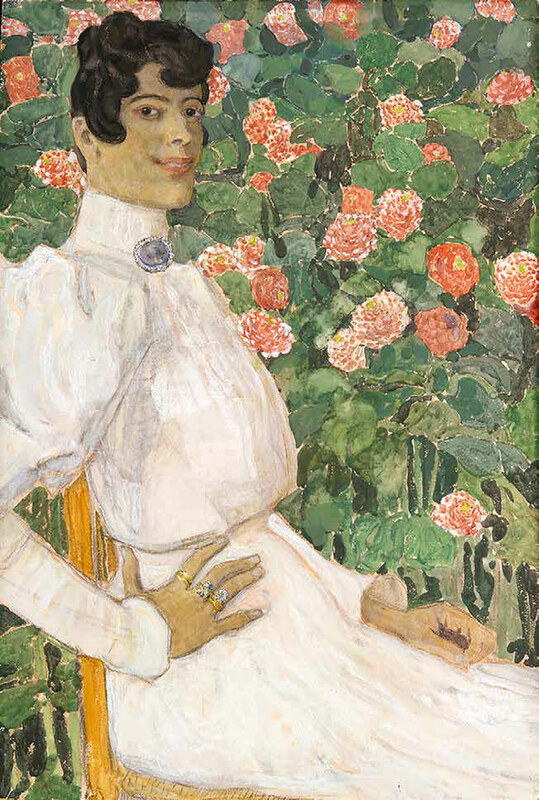 The 1904 issue of “Mir Iskusstva" included reproductions of eight of Anglada's works, all from the 1904 Paris Salon (in the period 1901-1904, the magazine reproduced 14 works by the artist in all). There were many real-life contacts between the Spanish and Russian artistic communities in Paris. Zuloaga was on friendly terms with three Russian patron-collectors, Ivan Morozov, Ryabushinsky, and particularly Ivan Shchukin. (Zuloaga's portrait of Shchukin, as well as his “El enano Grigorio el botero" (The Dwarf Grigorio, the Wine-skin Maker) from Shchukin's collection, are in the Hermitage, while two of his works, including a “Self-portrait", are in the Pushkin Museum of Fine Arts.) Another Russian artist, Paolo Trubetskoi, was a close personal friend of Sorolla, who painted his portrait and collected many of his smaller sculptures that can be found today in the Sorolla Museum in Madrid; Trubetskoi in turn created a sculpture portrait of Sorolla's close friend, Pedro Gil Moreno de Mara, who was both an artist and banker, and another patron of the Spanish artists in Paris. The other central axis of communication between the Spanish and Russian artists must have revolved around Sergei Diaghilev, both as a critic and, later in the 1900s, connected to his “Ballets Russes" productions in Paris. 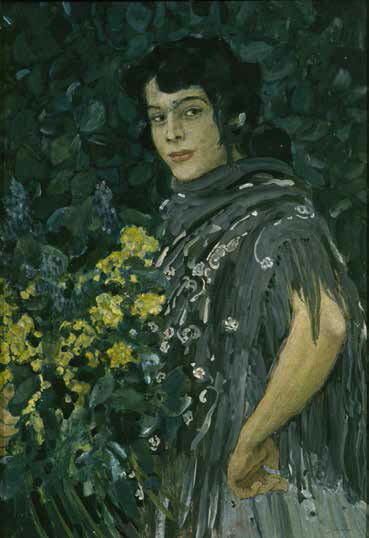 According to Spanish sources, Diaghilev was a significant collector of Anglada's work, and the Spanish critic Paloma Esteban Leal has written of the influence of the “Ballets Russes" on Anglada: “The real turning point in his [Anglada's] style, so evident in [his portrait] 'Sonia de Klamery (Lying)', came in 1909, with the arrival in Paris of Diaghilev's 'Ballets Russes', featuring Nijinsky and Pavlova. The event was a social and artistic sensation that revolutionized both tastes and customs. 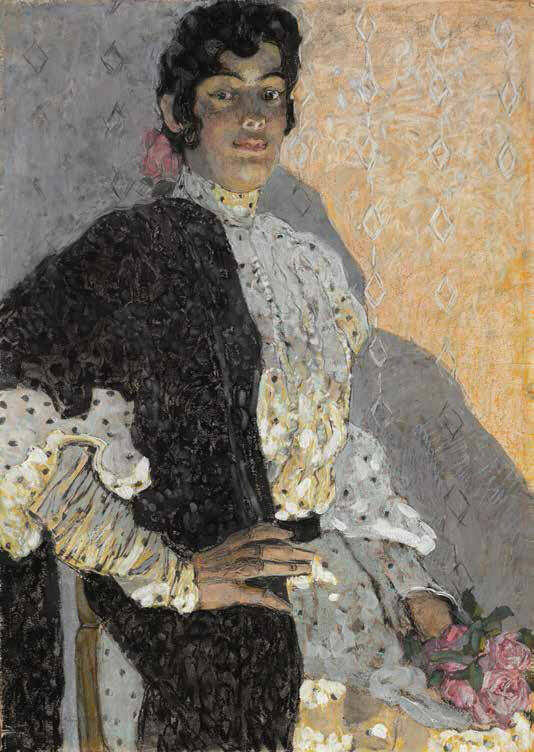 Anglada-Camarasa was deeply moved by the sets and costumes of vibrant oranges, purples and greens, to the extent that from then on the pale shades in his female portraits would be replaced by brilliant multi-colours. "3 Surprisingly Anglada, who frequently depicted dancers, is not known to have ever painted any of the “Ballets Russes" performers. 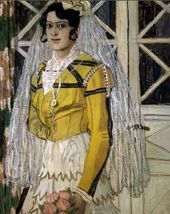 We know that Anglada later attended the premiere of the “Ballets Russes" production of “The Rite of Spring" on May 28 1913; thus, in the course of his interactions with the company over these years, it would be unlikely if Golovin never once met Anglada. 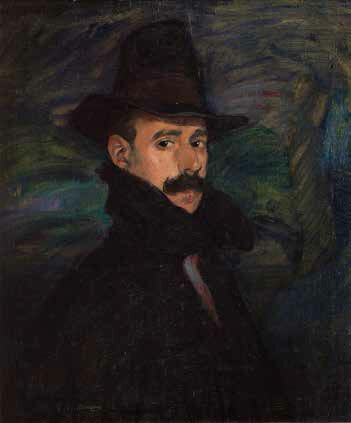 Diaghilev's other designer-collaborator, Alexandre Benois (Grabar had noted similarities between the work of that artist and Anglada, especially in studies of Breton life), was also clearly acquainted with the Spanish artists in Paris: when Benois travelled to Spain in 1907, he went with letters of introduction from Ivan Shchukhin and from Zuloaga, and very likely visited the Spanish artist's family in Segovia. All of this is more relevant in establishing that the Spanish and Russian artists shared a common milieu, rather than suggesting any distinct influences in either direction. It is, rather, a matter of artists reacting to particular moods of their time, reassessing their place as “national" artists within the “international" context of Paris, and their engagement with the artistic traditions of their native lands. Thus, while it would be wrong to suggest that Golovin drew on the work of Zuloaga, it would be fair to say that his own pictorial impressions of Spain exist in some sort of dialogue with those of the Spanish artists, Zuloaga in particular. Gollerbach wrote: “The Spanish painters did not make any particular impression on the artist [Alexander Golovin]. And although in some of his works there are occasionally some hints of portraits and landscapes that vaguely resemble Zuloaga, there is no direct influence in this case. The Spanish 'types' of Golovin have no national-ethnographical character - much more we could call them 'variations on motifs of Spain'." Onufrieva appears to disagree: “Some of these paintings, like 'Spanish Peasant Woman', are in their own way a variation on themes of Ignacio Zuloaga, an artist whom Alexander Golovin liked very much." It was most of all in his theatrical costumes that Golovin came close to the España negra of Zuloaga. 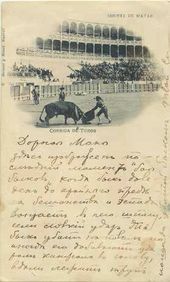 Golovin wrote of his 1908 Mariinsky Theatre production of “Carmen": “Within me memories returned. of that distinctive land, where there is such bright and fiery romance, which cannot be darkened even by the poverty that dominates practically all around the country. I tried to depict the real Spain in 'Carmen', without any adornment." Gollerbach too endorsed the artist's achievement in this area: “It is often assumed that Spanish national costumes are always and exclusively in bright, loud colours. Golovin showed that that is not the case - his Spanish figures are clad in grey, grey-brown, rust, brick, chocolate and black; bright fabric appears only in details. It is best to call them personified dreams about Spain, about this poor, wild, and beautiful country." “Two couples appear; their movements, from pose to pose, expressing passion and joy - they are accompanied by an old Spaniard (in a mask), in whom we feel something demonic; this scene is watched by a third woman, who is clearly suffering from loneliness and jealousy - she suddenly breaks into dance, trying to get one of the men to join her - she does not succeed, and she desperately rushes to the old man, who holds her half in humour, half in pity; the pantomime ends with this frozen expressive group. The costumes were gloomy black, form-fitting, soft and white-painted; the make-up was in black and white, with bright red lips. The roles were assigned as follows: the two pairs - the first, Marsheva and Shukhayev, the second - Deikarkhanova and Yakovlev; the single woman - Geints; the old Spaniard - Meyerhold." “[Anglada] took us to Montmartre to a Spanish cabaret, where the real Spanish people dance. It happened to be an Argentinian holiday, and there were Argentines celebrating in the cabaret. The tango, it turns out, is Argentina's national dance. The tango is a wonderful dance, but you have to see it in the performance of Argentines [as a teacher Anglada was much associated with young artists from Latin America, particularly Argentina - T.B.]. There was one couple there that danced so well that you could have sat and watched them for hours on end. A Spanish woman sung two Spanish songs to the accompaniment of a guitar. My God, how wonderful it was! “Anglada is charming. He has a great interest in Russia, and wants to write something for the theatre. He is ready to go and explore the old, forgotten corners of Spain to find real costumes. He was very interested in my 'Lovers' and very sorry that we hadn't written to him, so that he could have sent us some of the costumes that he has." The visual inspiration for this “pantomime" was Anglada's painting “Los enamorados de Jaca" (The Lovers of Jaca), a very large canvas (172 x 429 cm), dated 1910-1913. It depicts a group of five guitarists - five guitars can been seen in the picture, although the legs of the fifth player are barely visible - with a standing figure to the right. (Jaca is a small town in the north east of Spain, in the middle of the Pyrenees, the capital of Aragon until 1097). Anglada's style combines his characteristic elements of the fantastic with a sense of the España negra somewhat familiar from the work of Zuloaga. From its dating, 1910-1913, we can assume that the picture could only have been seen in Anglada's studio until that later year. So if Meyerhold was not in Paris in that period, who else except Alexander Golovin could have been the point of contact with Anglada? Even that is hard to confirm: although Golovin visited Paris in the spring of each year from 1906 to 1910 (the months of each of his visits abroad are recorded by Onufrieva), he did not travel there in 1911. Thus, his only chance to see Anglada's new painting in person would have come as early as his visit to Paris in April 1910; it cannot be excluded that he, or Meyerhold, saw a reproduction of the picture at a later date, but given that its colours are so distinct, and the narrative behind it so particular, it seems unlikely that Anglada's work would have made such an impression in a black and white photograph. 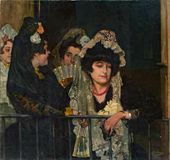 The enigmas of Golovin's associations with Spain revolve around the lack of detail with which he recorded his experiences in “Meetings and Impressions", especially this episode connected to Anglada-Camarasa. 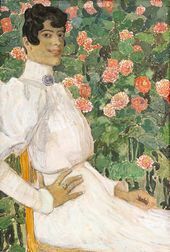 It is to be hoped that further research into the archives of the artistic figures concerned, both Spanish and Russian, with whom Golovin either was, or may well have been associated, will reveal more about this fascinating subject. For valuable context on subjects raised in this article I am indebted to: William Hauptman, preface to “El Modernismo: From Sorolla to Picasso, 1880-1918", 2011 exhibition catalogue, Fondation de l'Hermitage, Lausanne, with Editions 5 Continents, Milan. International unattributed quotations below are taken from that source. Pizarro, Silvia. 'The Dance: A Pretext for Painting' in “Anglada-Camarasa: Arabesco y Seduccion", exhibition catalogue 2012, Carmen Thyssen Museum, Malaga. P 185. Alexander Golovin. 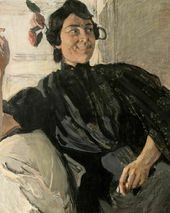 A Spanish Woman with a Cigarette. 1906-1907. Ignacio Zuloaga. 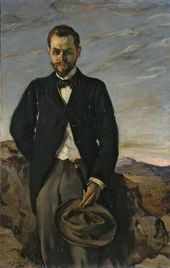 Portrait of Ivan Shchukin. 1899. 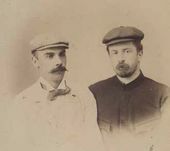 Alexander Golovin and Alexander Karzinkin. 1890s. Ignacio Zuloaga. The Dwarf Grigorio, the Wine-skin Maker. 1908. Ignacio Zuloaga. Preparation for a Bullfight. 1903. Alexander Golovin. A Spanish Woman in a Black Shawl. 1908. Alexander Golovin. A Spanish Woman in Green. 1906-1907. IGNACIO ZULOAGA. A Spanish Woman in a Box at the Plaza de Torres. 1901. ALEXANDER GOLOVIN. A Spanish Woman. 1906-1907. Alexander Golovin. A Spanish Woman in Red. 1906-1907. Alexander Golovin. A Spanish Woman with a Bunch of Yellow Flowers. 1906-1907. ALEXANDER GOLOVIN. A Spanish Woman in White. 1906-1907. Alexander Golovin. 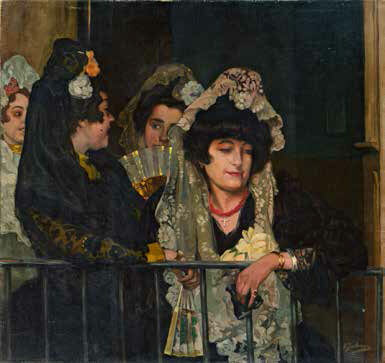 A Spanish Woman on a Balcony. 1911. A Postcard. Alexander Golovin to Maria Golovina. 1897.